Melanoma, the most serious type of skin cancer, develops in the melanocytes (cells producing melanin). Melanoma is the third most common cancer in Australia for both genders, following colorectal and breast/prostate cancer. Melanomas are predominantly found in sun exposed skin, however rare cases can occur in the mouth, eyes, and genital area. Most melanomas can be cured if detected at an early stage. At Kew Dermatology, our dermatologists are committed towards the early detection of melanoma, keeping abreast of the latest clinical trials and research relating to melanoma. 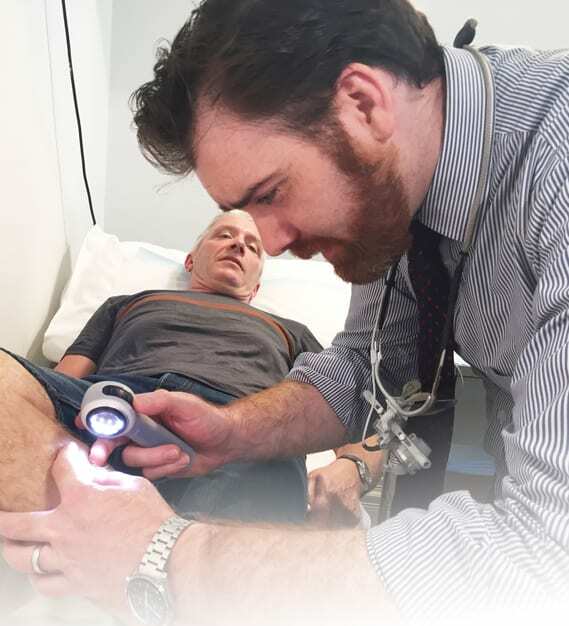 We evaluate patients with no previous history of melanoma to perform preventative checks as well as manage patients who have a history of melanoma in the family, who have had melanomas removed or who have been diagnosed by their GP to have a lesion of concern. Melanoma at an early stage generally requires surgical removal, which we usually perform in our well-equipped facility on site. In cases of advanced melanoma, we coordinate your surgery with the Victorian Melanoma Service or a plastic surgeon where necessary. The treatment options for advanced stages may include surgery to remove affected lymph nodes, chemotherapy, and radiation therapy. How do I identify a melanoma? changes in the colour, size or shape of spots (ABCDE). Asymmetry: One-half of a mole or birthmark does not match the other. Border: The edges become irregular, ragged, notched or blurred. brown or black or sometimes patches of pink, red, white or blue. melanomas can be smaller than this. Evolving: The mole changes in size, shape or colour.